World Book Day (5 March) is a joyous celebration of books for children, encouraging them to read in a world dominated by digital pleasure. Primary teachers by the score dress up in brightly coloured clothes and tell the children to come to school in fancy dress. For the children the opportunity to “become” some of their favourite characters for the day is irresistible. Other than the obvious Hungry Caterpillar, The Cat in the Hat, and various Harry Potter characters, I am not sure I can identify many of these. The books I read as a child, and those my children read, have of course been superseded. But like all aspects of life these day sometimes rustling up an outfit can be a bit of strain, on top of baking for the church fete, selling raffle tickets for Greenpeace, and catching up with old friends. Please bear the mothers in mind. This is yet another requirement for the overworked and underpaid masses of women who are already stretched and often stressed. The time when your children are young is probably the hardest time of your life. (I am in awe of those who sew and blog as well as look after young children). With just two days notice my grandson’s nursery said they would be doing World Book Day and could the children bring in their favourite book, and come in their outfit? My daughter looked exasperated – caught between wanting to enthuse and support her son, fit in with the nursery’s requirements and her shortage of time and money. I wanted to help. Making something special would have been fun for me. But I didn’t have the time on this occasion. I suggested we recycle the pirate outfit, but she wanted something new. 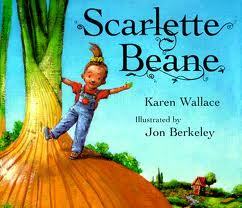 With no time to sew a complete outfit we came up with Scarlette Beane – a little girl who grows a lot of vegetables. The advantage of this book, as well as being a favourite with Ted, was that we actually had some fabric vegetables in the toy box. Plus a pair of dungarees in the wardrobe. And a scrunchie. I found a metre or so of chain, used to weight a jacket, and some safety pins. Half an hour later we had an outfit that would, hopefully, pass muster. Into Ted’s dungaree pocket we jammed a grey glove rabbit I had previously made for Ted. 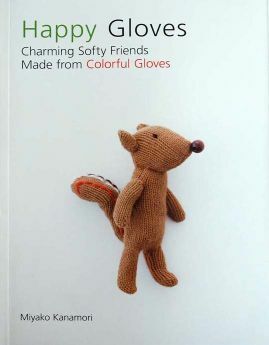 I got the pattern from this lovely book, by Miyako Kanamori. The “green fingers” were created with a felt tip pen (as food colouring was not effective) and the rosy cheeks are by Max Factor (lipstick). Wellies are model’s own. Very cute!! I dressed up as Dracula. Good job Granma. Ted is so beautiful. Women who sew, blog, look after children and work amaze me. They must go to bed later than I do that’s for sure. This is a great outfit! I love it when you have everything at home already. Ted looks fantastic! Great teamwork too. It’s a dilemma though. This ia a super way to encourage children to read book, but it does rather assume we can either afford a fancy dress outfit or are a creative genius or has time on their hands to sort this out or know someone who is any of the first three. 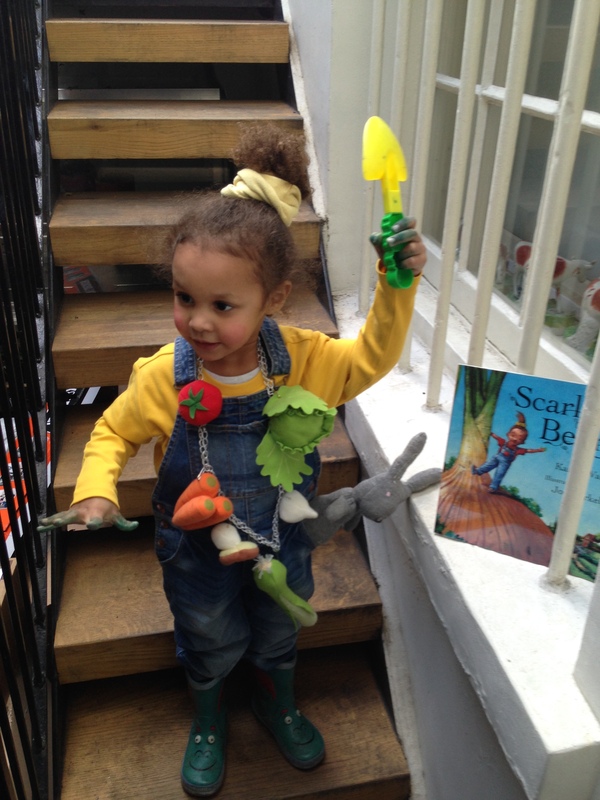 World Book Day is a bit tedious from a parental perspective – it was our first one this year and we had one week’s warning! Genius, Ted is adorable. World book day has just appeared on my radar mainly because it was in the news about a boy going to school as Christian Grey, bonkers, but funny. I’ve never heard of this, but wanted to say that Ted is so sweet in that photo. Great, quick thinking on the costume! I was very pleased when my year 2 daughter only had to take in her favourite book. Last year we did Alice and I was ashamed to say I went on to Amazon for an outfit. I just didn’t have the time to knock something up. But it was rubbish quality…..
Oh, he is so sweet, that’s a perfect costume! And you won’t forget this, ever. I’m afraid I alienated a lot of mums when I made my daughter’s Snowhite costume for her first World Book Day but I did it because I had less money than time and also because I wanted to learn to sew. I finished in the morning, 1 am, and later my daughter assumed all the girls’ OTT, beribboned Disney costumes were home-made too! One of my favourite costume choices that I’ve seen over the years – easy too – is Burglar Bill (or Burglar Betty); a stripy top and an eye mask! Nice book too.